Directors of The Comparison Project, Drake University professors of philosophy and religion. In the final event of its 2013-2015 series on “religion beyond words,” The Comparison Project’s directors, Tim Knepper and Leah Kalmanson, will compare over the programming of the last two years, raising philosophical questions of meaning, value, and truth about ineffability in comparative religious perspective. Knepper and Kalmanson will explore the diversities of ineffability in nine religious traditions as well as the arts and literature, focusing on the distinctive means by which humans speak about things they say cannot be spoken. Ultimately, Knepper and Kalmanson will also assess the ends toward which ineffability has been deployed in the practice and study of religion. Timothy Knepper is associate professor of philosophy and religion at Drake University. He teaches and publishes in the philosophy of religion, comparative religion, late ancient Neoplatonism, and mystical discourse. He is the author of books on the future of the philosophy of religion (The Ends of Philosophy of Religion, Palgrave, 2013) and the sixth-century Christian mystic known as Pseudo-Dionysius the Areopagite (Negating Negation, Wipf & Stock, 2014). 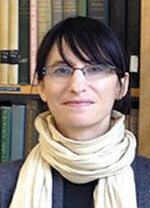 Leah Kalmanson is Assistant Professor of Philosophy and Religion at Drake University. She researches and teaches in the fields of Asian and comparative philosophy, continental philosophy, and postcolonial theory. She has published the co-edited volumes Confucianism in Context (SUNY 2010), Levinas and Asian Thought (Duquesne 2013), and Buddhist Responses to Globalization (Lexington 2014). *Note about Kalmanson’s presentation: Kalmanson is indebted to works by Tomoko Masuzawa and Jason Ānanda Josephson (listed below) for her discussion of the history of the term “religion” in Europe. Her quotations in the Hakuseki-Sidotti exchange are taken (at times with slight modification) from the Josephson source. Josephson, Jason Ānanda. The Invention of Religion in Japan. Chicago: University of Chicago Press, 2012.